It is ironic for a vehicle as no-frills as the Jeep Wrangler Rubicon to wear accessories, but this is the world we live in now. Vehicle personalization has become a business within the bigger automotive business. It’s become an avenue for customers and car owners to customize their vehicles to suit their tastes and preferences. The Wrangler Rubicon 1941 is a good example of that. On the surface, it sports a Hella Yella exterior paint finish. It’s a fancy name for a splashy color, and it’s one of the many additions to the overall Wrangler Rubicon 1941 package. Equally eye-catching is the “1941” decal on the hood. The year in question is a nod to the birth year of the original military Jeep from Willys, from which the company traces its origin. Small black decals running from the door to the rear section add a few more hat tips to the birth of the first Willys Jeep. In addition to the Hella Yella body finish, black accents play an important role in the Wrangler Rubicon 1941’s aesthetic makeup. The entire lower section of the Wrangler Rubicon sports an all-black look, including a matte black grille and black accents on the door handles, door sills, mirror caps, mudguards, and the fuel door. Even the mesh sun bonnet room is finished in black to keep the two-tone visual integrity intact. The overall look of the Wrangler Rubicon 1941 is in line with what you’d expect from Mopar’s parts and accessories catalog. But as is always the case with Mopar, there’s more to this showcase Wrangler Rubicon than fancy paint and black accents. 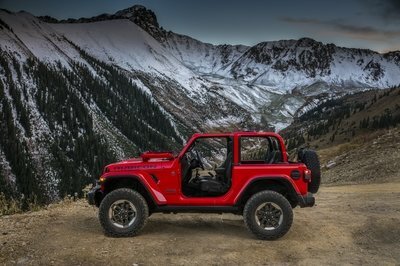 Given the Jeep’s nature as an off-road marauder, it wouldn’t be complete without a handful of parts that can be of important use for the Wrangler’s off-road adventures. This is where Jeep’s Performance Parts operation comes into the picture. 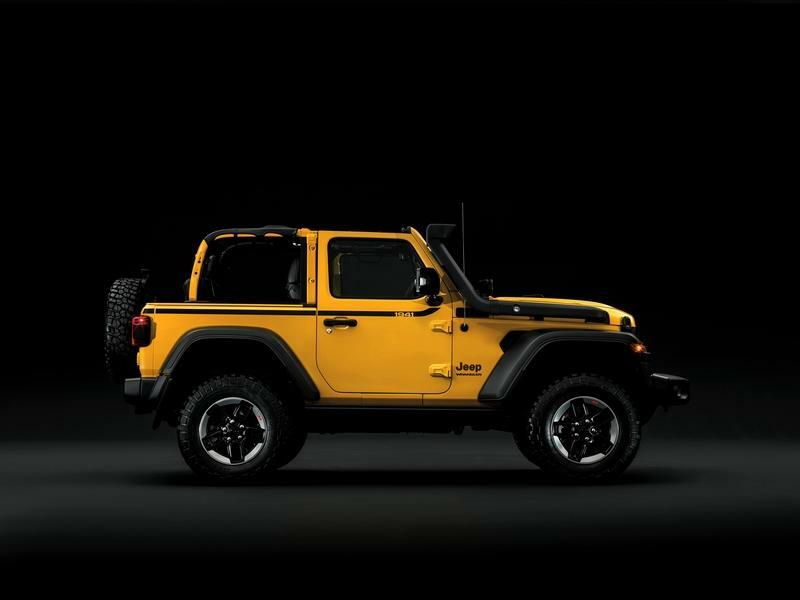 The Wrangler Rubicon is more than just eye-candy; it’s also equipped with a number of important parts, including that unmistakable snorkel air intake that’s connected to the engine and bolted on the front passenger side. It runs along the side of the hood, snaking up alongside the Wrangler Rubicon’s A-pillar. 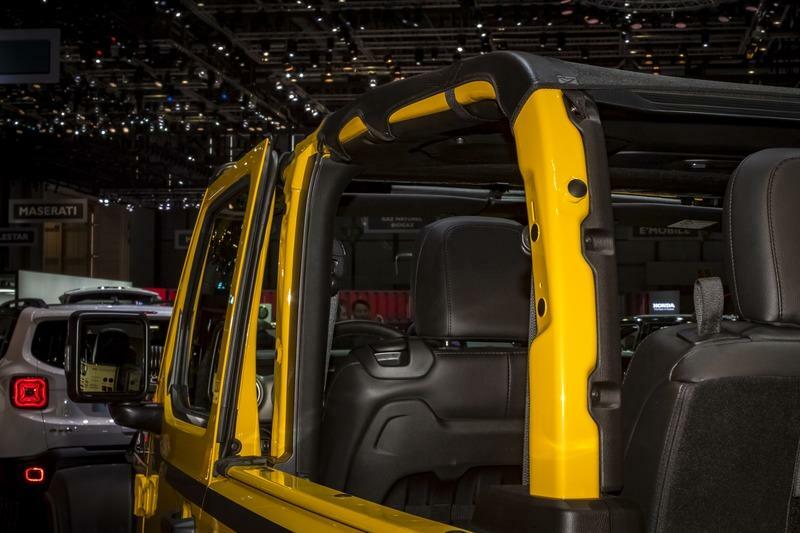 Black door sills and rock rails are also included in the showpiece Wrangler Rubicon. 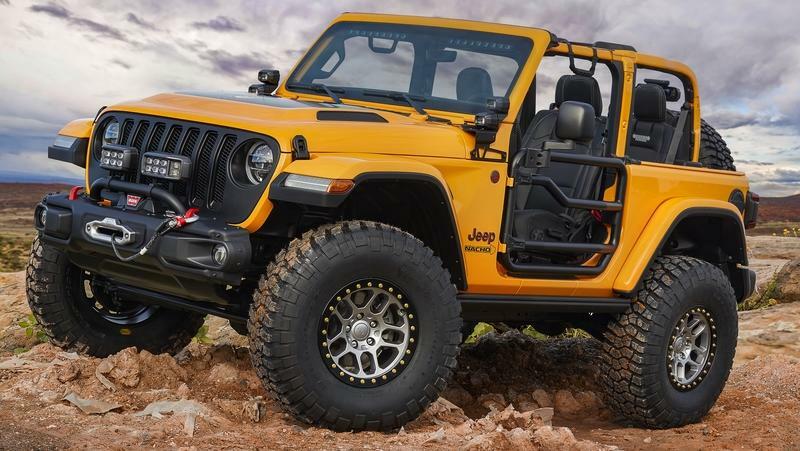 Jeep wasn’t direct in identifying the wheel-and-tire combo that’s included in the Wrangler Rubicon 1941, but we do know that the off-roader traditionally sits on a set of 18-inch wheels. 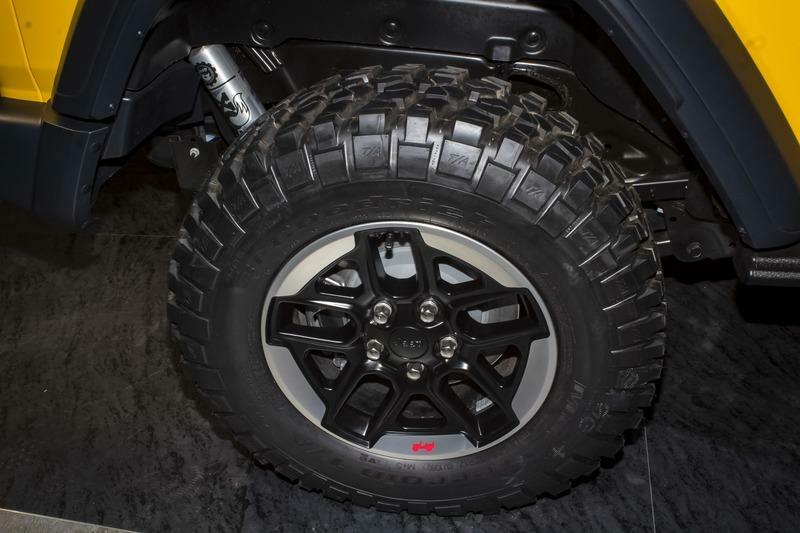 It’s hard to identify the size of the wheels that are included in the showcase Jeep, but they do look like an 18-inch set. There are more wheel sizes available — the usually run from 15-inch wheels to 20-inch wheels. — so you do have the option of scoring anything from 15-, 17-, and 20-inch wheels depending on what size best suits your needs. 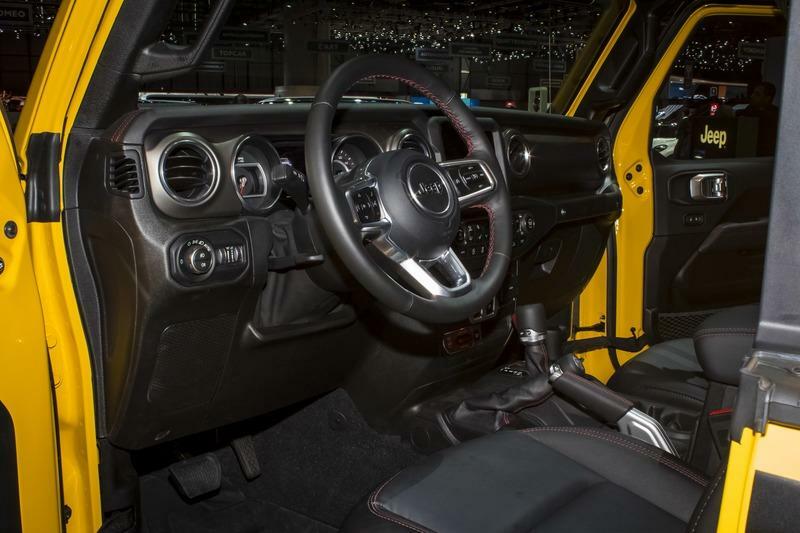 The Jeep Wrangler Rubicon 1941’s interior is typical of what you’ll see in the cabin of a standard Wrangler Rubicon. The seat configuration remains the same. The layout remains the same. The features remain the same. In true off-road fashion, creature comforts take a back seat to a lot of useful on-the-go features. 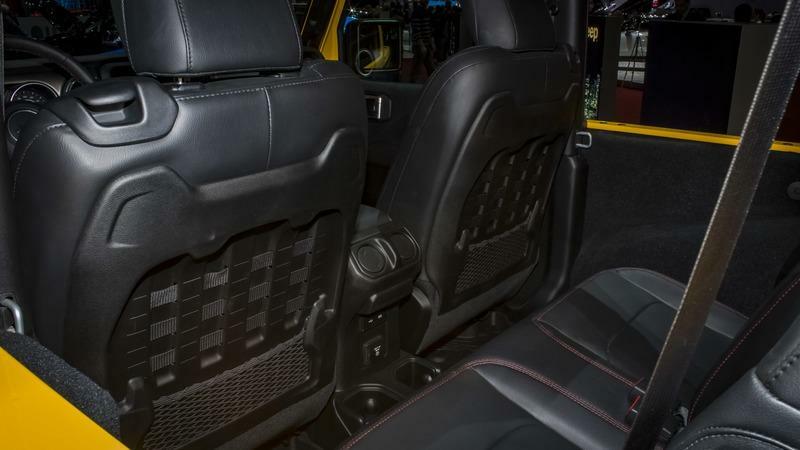 Premium cloth comes standard in the interior of the Wrangler Rubicon, but there is the option to avail the more premium leather trim, which is available in either black or tan finishes. I suppose that’s one premium offering you can get on your off-roader Jeep. The rest of the useful bits are function-oriented as opposed to visually stimulating. Take the rubber that surrounds the UConnect touchscreen system. It’s not there to look good but to protect the digital display from unnecessary dings. The interior knobs, buttons, and toggles have all been tested, too, at least as far as their sturdiness is concerned. Useful storage space is also a hallmark of the Wrangler Rubicon’s cabin. In standard form, the cargo floor in the rear is removable. That opens up a rear storage area where you can store just about anything you want. Optional storage systems like the Trail Rail and the Utility Grid are also available. The latter is even inspired by MOLLE-style tactical packs that are used by armed force units from all over the world. In keeping with the Wrangler Rubicon’s go-anywhere identity, the wash-out feature is probably the most underrated aspect of this off-roader. This feature has been available on Wrangler models for a while now so it’s nice to see that it’s still available in the 2019 model. The feature includes a removable carpet and new one-way floor drain valves. These valves allow you to wash away all the dirt and grime you accumulate in your excursions. Pretty useful, right? All of these — well, not the Trail Rail and Utility Grid storage systems — are available in the Wrangler Rubicon trim. That’s great because the 1941 version we saw at the Geneva Motor Show didn’t exactly have an auto show worthy cabin. In fact, the only useful bits are the front grab handles and the aforementioned black mesh sunbonnet. It’s not exactly the truest showcase of Mopar and Jeep’s Performance Parts’ offerings, but it does offer a nice sample of what you can expect from these accessory mavens. Even if you’re not sold on the 1941’s interior, there are other options that are available for you to spend on. Just don’t get too trigger-happy with all of them because you might end up with a cabin that loses a lot of its identity. 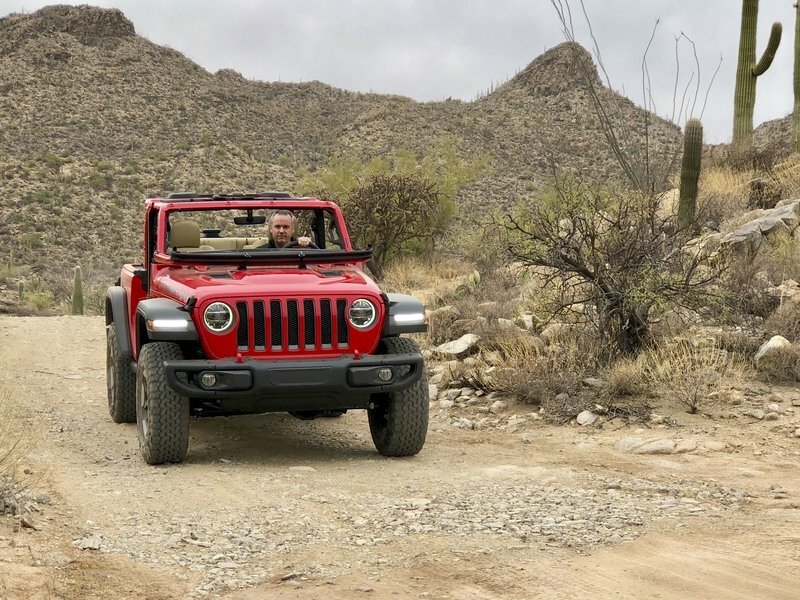 At the heart of the Euro-spec Jeep Wrangler is a 2.2-liter turbo-diesel four-cylinder engine that produces 200 horsepower and 332 pound-feet of torque. This isn’t the only engine available for Wranglers that are specific to the Old Continent. 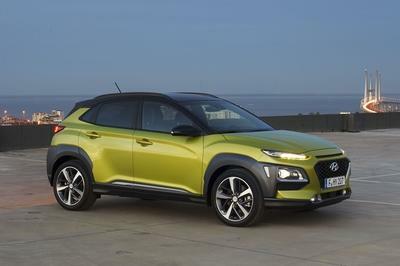 A 2.0-liter four-cylinder unit is also available. 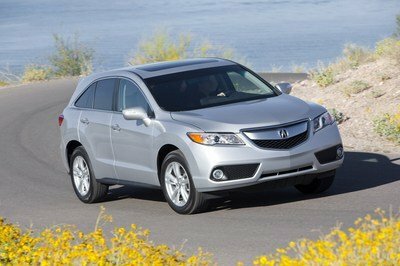 It produces 270 horsepower and 295 pound-feet of torque. 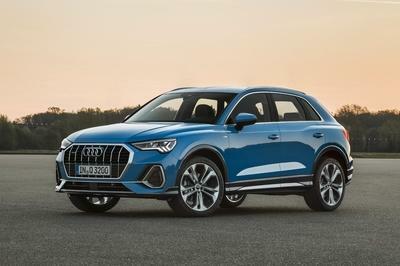 Note that this particular engine is also available in the U.S. market, as is a 3.6-liter V-6 engine that produces 285 horsepower and 260 pound-feet of torque. This particular engine is available in the U.S. and other specific markets, including Africa and the Middle East. It’s unclear which of these engines is found under the hood of the Wrangler Rubicon 1941. 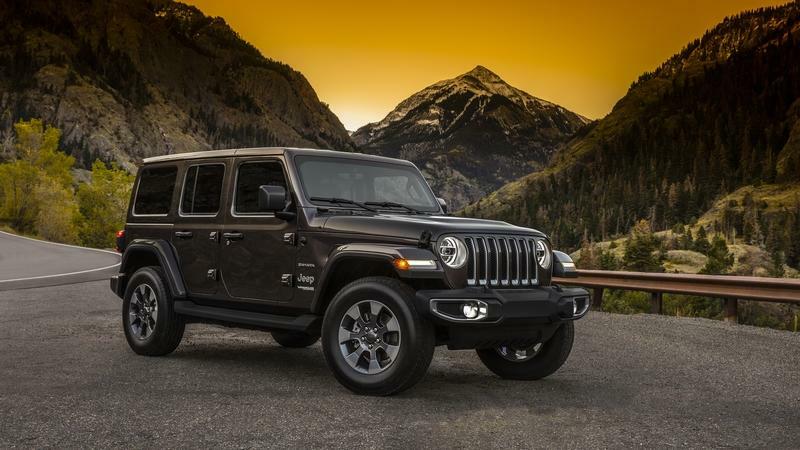 My money’s on the 2.2-liter turbo-diesel four-cylinder, though, if you’re looking for more power for your Wrangler Rubicon, the turbocharged four-cylinder engine should be your choice of engine. Whichever engine you prefer, you’re not going to be shortchanged in off-road chops. The Wrangler Rubicon 1941, in particular, rides higher than usual because of a two-inch suspension lift kit. 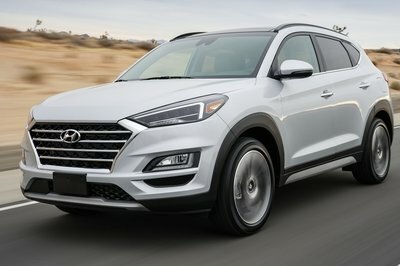 Not only does it provide extra space between the road and the off-roader’s underbelly, but you’re going to be thankful that you have it in those times where the roads get a little too unpredictable. The Jeep Wrangler Rubicon 1941 doesn’t suffer from an identity crisis. In fact, it has a unique identity of its own, in large part created by the parts and accessories from Mopar and Jeep’s very own Performance Parts division. This is what your Wrangler Rubicons can turn to if you decide to give it a personalized makeover. It doesn’t always have to look like this, but if you need a peg or an inspiration on what you can do to your Wrangler Rubicons. The choices are there and the options are available. All you need to do is go through the catalogs and pick your poison. Oh, and get your checkbooks ready, too. Taking this sort of personalized route on your Wrangler Rubicon is a bane to the bank account. The exceptional Wrangler Rubicon 1941 struts its stuff on the Jeep® stand with a full Jeep Performance Parts by Mopar trim capable of taking the desire for adventure to the max: it is the European preview of a special 100% street legal off-road configuration. Also in the spotlight, an urban version of the Wrangler Sahara, sporting Authentic Accessories by Mopar and chromed details. The Authentic Accessories powered by Mopar and dedicated services enhance the potential of all the FCA Group cars and also stand out on the Alfa Romeo, Fiat and Abarth stands. 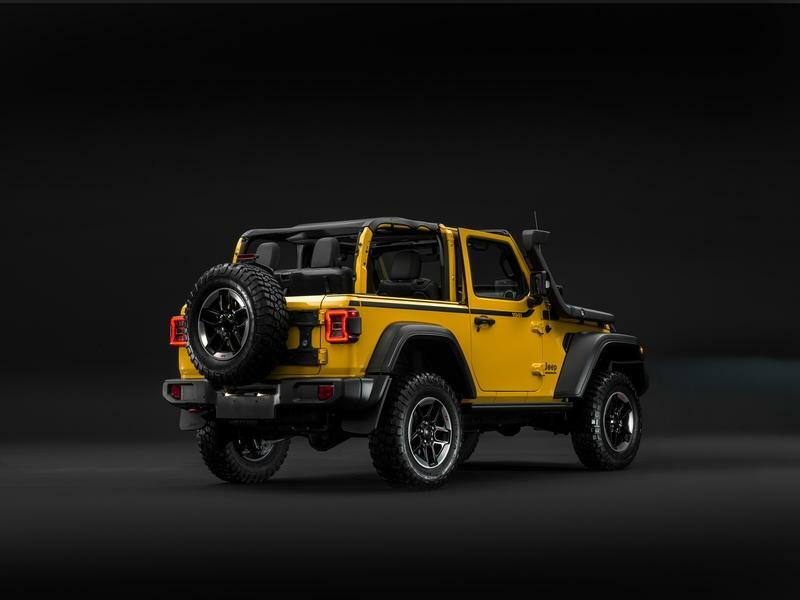 The new Jeep Wrangler Rubicon 1941 designed by Mopar makes its European début at the Geneva International Motor Show with a 100% street legal trim especially designed for the off-road vehicle that takes the desire for adventure to the max. Like every accessory studied by Mopar, the Jeep Authentic Accessories are designed to provide maximum functionality, safety, style and performance because they are created with the same team that designs the original Jeep vehicles. The ultimate example is the new Wrangler Rubicon 1941, fitted with the Jeep Performance Parts that enhance the legendary off- road capability of Jeep Wrangler. Look no further than the kit with suspension raised by 2 inches, the snorkel, rock rails, black door sill, black fuel door and all-weather mats. The finishing touch to this tough configuration is a 1941 livery that commemorates an important year for the Jeep brand: the first appearance of the Willys, also evoked on other details of the vehicle such as, for example, the wheel, gear knob and tailgate table. 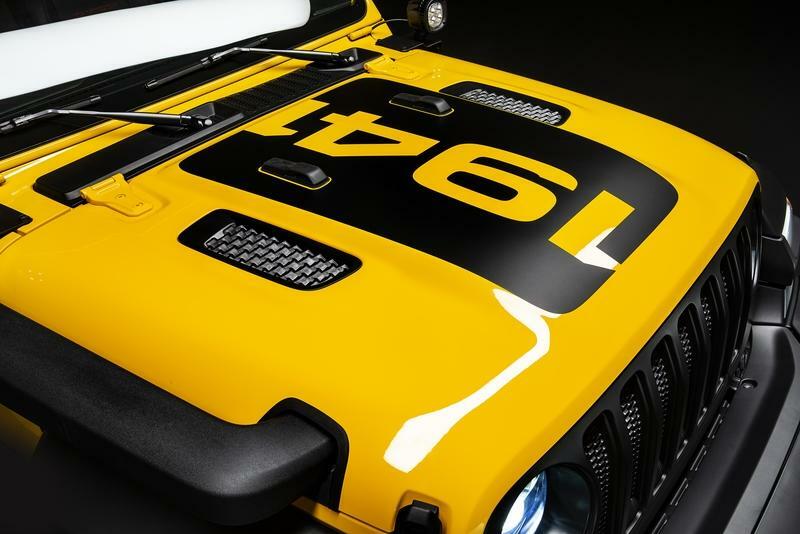 The vehicle is also enhanced with other Authentic Accessories selected from the range of over 200 Jeep Wrangler accessories: Matt black Seven Slots front grille, mudguard, off-road lights, mirror caps, all contrasting with the Hella Yella yellow paintwork. The Mopar customisation continues inside, with black mesh sun bonnet and front grab handles. 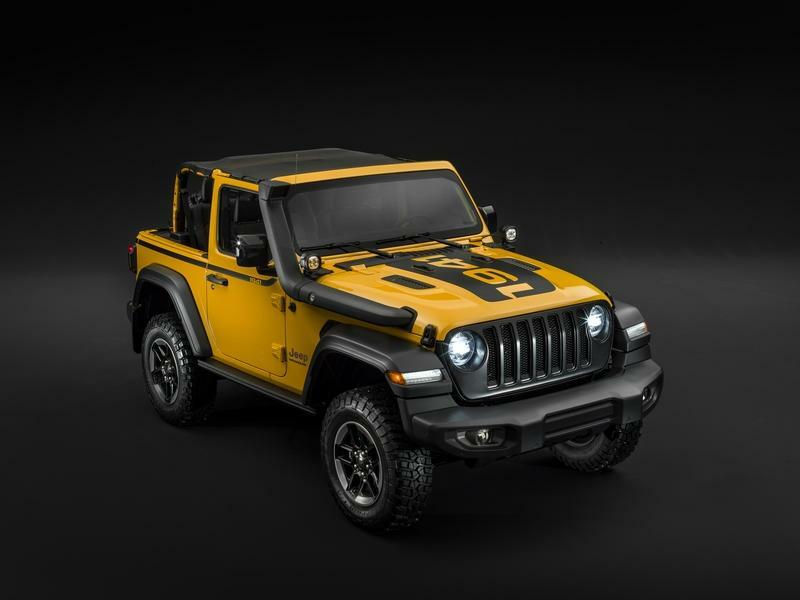 The Wrangler 1941 is directly approved by the Mopar and Jeep to deliver the true off-road experience, while maintaining the 100% street legal appearance. Mopar does not only mean “off-road”, but is also capable of characterising the Urban versions, such as the Jeep Wrangler Sahara in urban trim with chrome fuel cap and door sill guards that stand out on the Ocean Blue colour body. Finally, a Jeep Renegade Limited, sporting the all-new Bikini body colour, is also characterised by a special urban look, featuring door sill guards with Jeep logo, front dam, new sill trims and rear scuff plate in Subshine Grey, which is the same colour as the specific mirror caps and front grille. The cabin offers a cargo organizer and carpet mats. A selection of creations and customisations by Mopar for Alfa Romeo, Fiat and Abarth will also be making a statement on the other FCA brand stands. The accessories developed for Alfa Romeo are unique and distinctive, ideal for enhancing the sportiness and unique personality of Giulietta, Giulia and Stelvio. Fine materials such as carbon fibre characterise the mirror cap, radiator grille, spoiler, gear knob and door sill guards, while the textured tones of Miron personalise the specific alloy wheels. The Alfa Romeo branded puddle lights, and the dark tail lamps on Stelvio are only some of the characterising elements to be found on the stand in Geneva, both on board the vehicles and on display. On the Fiat stand, two displays will house a selection of Fiat Authentic Accessories: the Carbon Pack for Tipo Sport and the Dark Pack for 500X. The first pack features a number of carbon details with markedly racing style, such as the full front and rear bumper kits, side skirts, rearview mirror covers and door handles. The vehicle, in the Tipo Sport version, is equipped with the same accessories in the “Dark Pack”. And the captivating 18” rims are also available as optionals. The second is one of the aesthetic packs for 500X created thanks to the know-how of the experts at Mopar to emphasis the characteristic elegance, design and sporty style of this Italian crossover by Fiat. Finally, some of the key Authentic Accessories developed by Mopar for the Abarth 124 spider include the carbon fibre hard top: hi-tech, lightweight and safe, it gives the car a true coupé style while retaining all the excitement and driving pleasure only a genuine roadster can offer. The sportiness of the vehicle and its performance in terms of road holding are also boosted by the specific strut bar, while the mesh luggage rack organiser with Mopar logo enables load optimisation, ensuring maximum freedom on the road.